Seven Shiite workers were gunned down Saturday in a religiously mixed area of west Baghdad, and explosions in the heart of the capital shattered a one-day calm after a ban on private vehicles expired. The United States was moving to bolster U.S. troop strength in Baghdad to cope with escalating violence between Sunnis and Shiites. The seven Shiites died in a drive-by shooting at noon near Baghdad International Airport, police Lt. Maitham Abdul-Razzaq said. Two other workers were wounded. Two rockets exploded Saturday in the heavily guarded Green Zone, which includes the U.S. and British embassies. There was no report of casualties. Earlier Saturday, two large explosions hit eastern Baghdad. 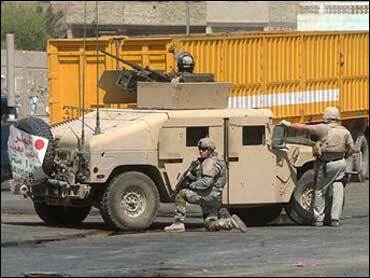 One targeted an Iraqi police patrol, but killed a civilian. The other struck at the Rasheed military camp. U.S. and Iraqi troops sealed off part of east Baghdad following the blasts and searched homes and shops looking for weapons. One civilian was killed in the crossfire when masked gunmen attacked Iraqi police in Mosul, and three gunmen died in an a separate firefight with police there, Khalaf said. A ban on private vehicles had kept down violence Friday after one of the most violent weeks in the capital this year. It expired Friday evening, and within hours, heavy bursts of automatic weapons rang out. Elsewhere, three people were killed and five were injured in a bombing and shooting in the market in Baqouba, where U.S. forces killed five civilians, including two women and a toddler, the day before. The U.S. troops had taken fire from a building during a raid for suspected terrorists. The U.S. military expressed regret over the civilian deaths and blamed extremists for putting civilians in danger, saying troops fired only after occupants of the building refused repeated orders to leave. The deteriorating security situation, especially in Baghdad, has alarmed U.S. officials, who had hoped that the new national unity government of Prime Minister Nouri al-Maliki would be able to ease tensions so that the U.S. and its international partners could begin removing troops this year. But the situation has gotten worse since al-Maliki took office May 20. Security is likely to top the agenda when al-Maliki visits the White House this coming week. Al-Maliki also said Saturday he will urge U.S. officials to work for a cease-fire in Lebanon, saying Israel's "hostile acts" adversely affect the entire Middle East. The U.S. command had drawn up plans to reduce the number of U.S. combat brigades in Iraq from 14 to 12 by September. But that plan has been shelved because of the security crisis in the capital. A senior U.S. defense official said the Pentagon was moving ahead with scheduled deployments to Iraq next month and was moving one battalion to Baghdad from Kuwait. Also Saturday, a government committee formed to reconcile Iraq's sectarian and political groups held its first meeting, but differences emerged immediately between top Shiite and Sunni officials over amnesty for insurgents. The Supreme National Committee for Reconciliation and National Dialogue convened behind the blast walls and barbed wire of the Green Zone in Baghdad. After the meeting, al-Maliki, a Shiite, told reporters that despite his proposal for amnesty for some insurgents, "all those whose hands were tainted with blood should be brought to justice." But the Sunni speaker of parliament, Mahmoud al-Mashhadani, said "if we punish a person who killed an American soldier, who is an occupier, we should punish the American soldiers who killed an Iraqi who fought against occupation."